A little over a year ago, we told you about a plan for a sixteen story tower and twelve for-sale residential units at 3201 Race St., replacing a surface parking lot and some poorly maintained homes. At the time, the project had already gone through the Civic Design Review process, but it hadn't yet gone before the ZBA. Within a month of our story, the ZBA gave their approval, paving the way for the project to move forward. Often with projects of this scope and cost, it takes some time to get everything properly lined up, so it's no shock that it took almost a year for the project to get moving. 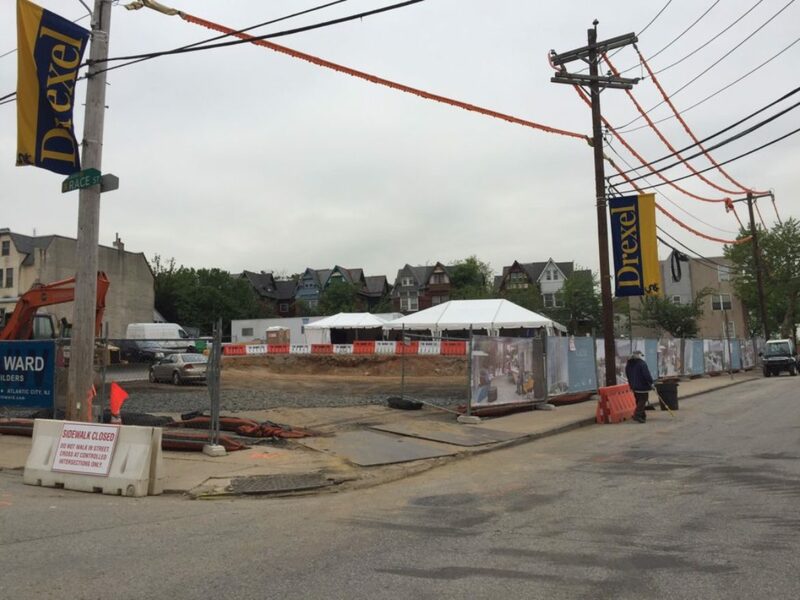 But as a story from the Inquirer tells us, the official groundbreaking is happening today. To refresh your memory, the project is from Radnor Property Group, the same company that built the recently completed 3737 Chestnut project. While that project entailed a partnership with the Philadelphia Episcopal Cathedral, this project is a partnership with Drexel, who will be maintaining ownership of the land. 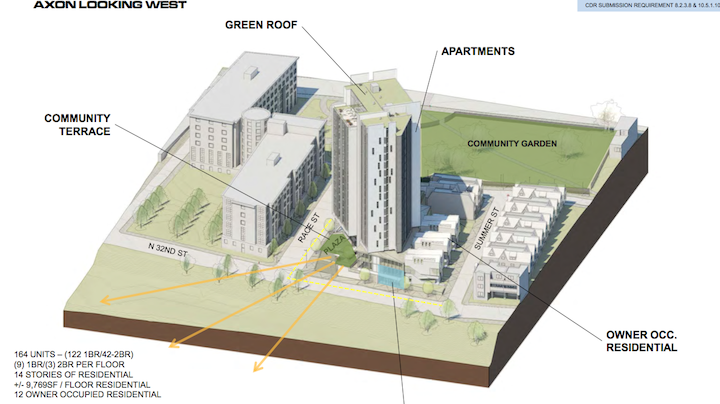 The top fourteen floors will have residential units for rent, targeting grad students and Drexel employees. The bottom floors will include a lobby space, a fitness center, and Chesterbrook Academy, a preschool with a capacity for 180 kids. In the basement, a small parking lot will accommodate 32 cars. A second phase of the project will mean the construction of three buildings containing twelve 2-bedroom condos units on the southern side of Summer Street. The entire project has been dubbed Vue32. Check out these renderings, with design work done by Erdy McHenry. As we said before, this project will rise on the edge of Drexel's campus, with acres of rail yards located directly to the east. But Drexel's Master Plan calls for the covering of the rail yards and the redevelopment of the reclaimed land. In this scenario, the footprint of the campus would expand dramatically to the east, and the "on the edge" Vue32 would suddenly find itself in the middle of a reoriented campus. Who knows what will happen in the coming decades but even if the rail yards remain as they are, this project is a huge upgrade over what's been here for many years. The tenant mix in this building also bears watching, as most development in this area has targeted students, specifically undergrads. If grad students and young professionals prove to be a viable target market in this part of town, we could end up seeing even more redevelopment to the north of Drexel in the years to come.